There's no place like Haven Point for the holidays, where the snow conspires to bring two wary hearts together for a Christmas to remember. 'Tis the season for sipping hot cocoa and snuggling next to a warm fire. 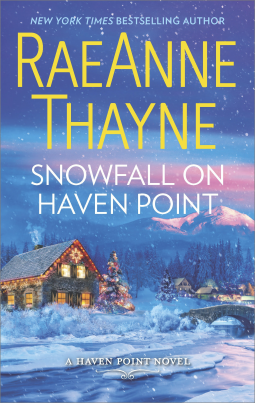 Add to that the next chapter of RaeAnne Thane's Haven Point Series, Snowfall on Haven Point, and you have yourself a very cozy evening! Snowfall on Haven Point is the right novel to kick off the cool season. Readers head to a wintry Haven Point to dig a little deeper into the lives of Andrea Montgomery and Sheriff Marshall Bailey. Though these characters were introduced in the previous novel Riverbend Road, it's not strictly necessary to read it if you have not been following the series. From the summary I thought this story would have a touch of Beauty falling in love with Beast, but the initial characterizations change over the course of the story. It describes what happens when certain circumstances may cause us to become open to new possibilities. Andrea and Marshall clash from the beginning which makes the story a refreshing respite from many 'love at first sight' plots. Their connection is forged over time and understanding. The issues between them are immense and unexpected, half the story is just getting them to admit their true feelings. They're both stubborn with their feelings toward one another, but when it comes to Andrea's children love comes easily. Despite their harsh start, this story has a gentle vibe. No doubt the cute little kids putting smiles on everyone's faces has a little something to do with it! When life gets tough or takes a turn for the worst for our hero and heroine, something or someone provides an uplifting hand. Snowfall on Haven Point is complex enough to show that most of the other characters have a story, one that has either been told in a previous novel or is soon to come. It makes for an interesting read, always looking to see how characters connect to one another. Faithful followers of this sweet romantic series will be curious to see who will next shake up the tight-knit community of Haven Point.